Many of the foreign embassies in Washington, DC are located along Massachusetts Avenue near Dupont Circle in the neighborhood that is referred to as Embassy Row. They are housed in beautiful historic mansions that were owned by Washington's elite prior to the Great Depression. Some countries have an elaborate diplomatic presence in Washington, while others are quite modest with the minimal staff needed to maintain diplomatic relations. Enjoy these photos and take a peak at many of the embassies along Embassy Row in Washington, DC. Please note that the following photos were taken on a walking tour. There was no intent to exclude any embassies. Victorian mansions, many of which have been converted into embassies, surround Dupont Circle and remind the visitor of Massachusetts Avenue in its residential heydey during the early part of the 20th century. 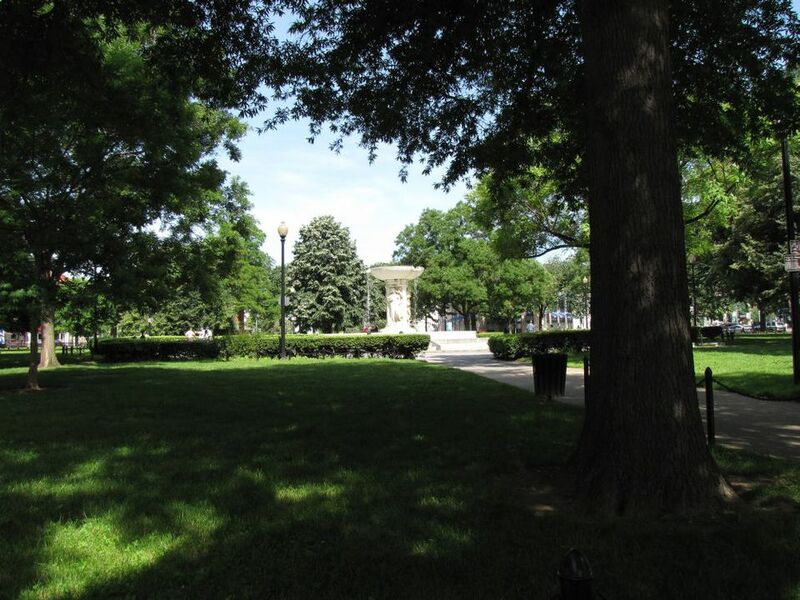 Today, Dupont Circle is a popular park which serves as the central point to a cosmopolitan neighborhood with fine museums, private art galleries, fine restaurants and eclectic shops. Mahatma Gandhi was the political and spiritual leader of India who led a nonviolent resistance movement against British colonial rule during the first half of the 20th century. This statue of Gandhi is located near the Embassy of India in Washington, DC. Philip Jaisohn was the leader of the social and political reform movement for Korea's independence. He was also the first Korean to become a naturalized citizen of the United States. This statue of Philip Jaisohn is located in front of the Embassy of South Korea in Washington, DC. Alberto Santos-Dumont was an early pioneer of aviation. He is considered the "Father of Aviation" in Brazil, his country of birth. This bust sits on the street corner in front of the Embassy of Brazil in Washington, DC.